Descaler and decalcifier for home coffee and espresso equipment. Over time (and especially in hard water environments) a machine will need to be thoroughly descaled in order to preserve quick brew times and hot brew temperatures. Dezcal� is specifically designed to address these concerns. Solely a descaling agent, Dezcal� is engineered to remove even the toughest scale buildup from machinery. At the same time, it is tempered for use on all of the materials which normally comprise coffee and espresso equipment so it is "tough on scale, but easy on equipment". 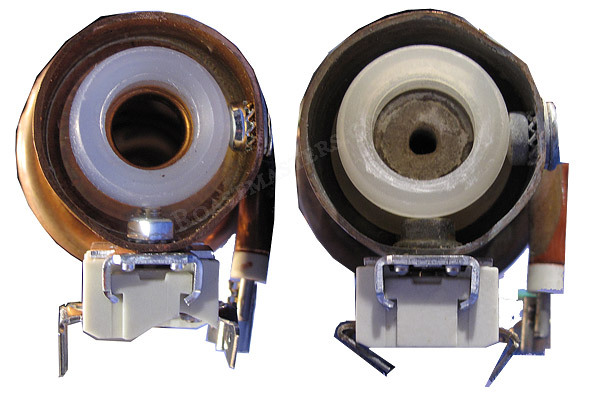 Left - view of clean Technivorm heating element. Right - the same element clogged with scale and calcification. Dezcal will remove this blockage. As you can see from the photo above, scale can build up until brewing water can no longer flow or flow at the correct rate. This condition can vary widely depending on your water. Use Cleancaf periodically to keep your coffee brewer clean and as a scale preventer. But, if your brewer is running slowly or has stopped completely due to scale buildup, Dezcal is the product to use. A box of Dezcal contains 4 packets.